This 12-week social skills curriculum, developed by Dr. Jed Baker, director of the Social Skills Training Project, includes information about assessment of autism and social communication problems, as well as strategies for teaching social skills, promoting generalization of skills across settings, and sensitivity training for peers to promote acceptance and inclusion of students with Autism Spectrum disorders and social communication disorders. Individual skill lessons and learning activities cover a wide variety of social situations, with specific examples for different age groups. Tips on behaviour management are provided for educators, as well as detailed lesson plans and over 70 activities to help students develop the social skills they need to be successful at school and in life. Baker, J. (2003). 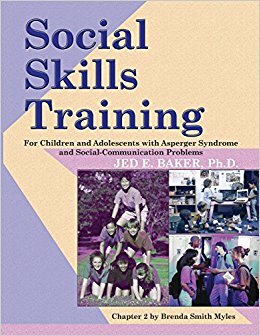 Social skills training: For children and adolescents with Asperger Syndrome and social-communication problems. Shawnee Mission, KS: Autism Asperger Publishing Company.